A FEW MONTHS ago, it was all going according to plan. President* Trump had anointed his golden boy, Brett Michael Kavanaugh, to be the next Justice of the United States Supreme Court. Trump had already praised Kavanaugh to the skies. “Judge Kavanaugh has impeccable credentials, unsurpassed qualifications and a proven commitment to equal justice under the law,” Trump said from the East Room of the White House, on July 9. But things have changed. 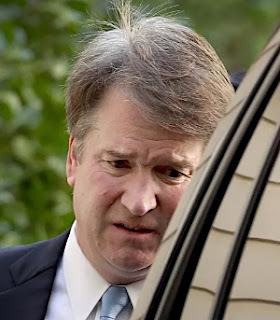 Thanks to allegations from (at this writing) no fewer than five presumably credible accusers, including Dr. Christine Blasey Ford, testifying before the Senate Judiciary Committee this morning, Sept. 27 — and the nominee’s own previous embroideries of the truth, the Supreme Court nomination of Kavanaugh is in trouble. 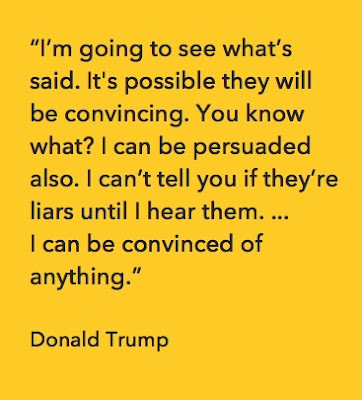 If you wanted to confirm that, read the statements from the man who nominated him, Trump himself. Read closely. Trump called Kavanaugh “a fine man with an unblemished past and these are highly unsubstantiated statements from people represented by lawyers,” adding later that it would “be sad indeed” if he’s prevented from serving on the nation’s highest court. Note the hedging, conditional language there: Kavanaugh is “a man who has the potential” to join the court, and it would “be sad indeed” if he didn’t. I can be persuaded. 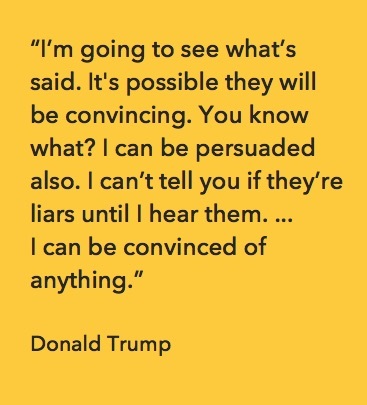 I can be convinced of anything. You don’t need to put the message on a sandwich board for it to be perfectly clear: Kavanaugh’s status in jeopardy and The Don is throwing him under the bus in slow motion. Much will depend on how well Blasey Ford performs; sometimes the best laid plans of witnesses come undone under the withering glare of a Senate committee. But if the doctor is even remotely credible in her full testimony, and she probably will be, Trump would do well to start doing what for him has been unimaginable: Imagining some other candidate for the Supreme Court. Image credits: Kavanaugh: via The Root. MUCH OF the current hue and cry over Judge Brett Kavanaugh’s possible confirmation to the United States Supreme Court hinges on his credibility in the face of allegations from Christine Blasey Ford, a California college professor and research psychologist, concerning an alleged sexual assault back in the 80’s, when she was a student at Holton-Arms School and Kavanaugh was a student at Georgetown Preparatory School, in Maryland. “Ford said that one summer in the early 1980s, Kavanaugh and a friend — both ‘stumbling drunk,’ Ford alleges — corralled her into a bedroom during a gathering of teenagers at a house in Montgomery County. Kavanaugh has denied the allegations root and branch. In a statement released last week, the judge said “I categorically and unequivocally deny this allegation. I did not do this back in high school or at any time.” A man believed to be a witness to the event, the filmmaker and author Mark Judge, has denied Blasey’s assertions in rather expansive terms, and has denied knowing anything about the party. Republican Sen. Susan Collins of Maine spoke to reporters on Sept. 17, saying that if Kavanaugh wasn’t being truthful about these allegations, “that would be disqualifying.” The right-wing brain of the punditocracy has similarly suggested the same thing, confident that Kavanaugh's denials would carry the day. BUT THE larger, more panoramic problem for the Republicans vis-à-vis Kavanaugh the nominee has been playing itself out for weeks. If the nominee’s truthfulness is the tripwire for disqualification, Kavanaugh may have already dealt himself a fatal blow. The attention rightly paid to the Blasey-Kavanaugh dispute is one thing. What’s been somewhat overlooked by comparison is the assertion, based on reporting from several sources, that Kavanaugh has lied in Senate testimony, previously and before the very committee convened to determine his fitness for the Supreme Court. Jeremy Stahl’s story in Slate on Sept. 12 is valuably comprehensive in exploring Kavanaugh’s apparent perjuries before the Senate Judiciary Committee’s most recent hearing earlier this month, and at hearings in 2004 and 2006. And Pima Levy and Dan Friedman of Mother Jones were just as good in their exhaustive Sept. 6 story documenting Kavanaugh’s mistruths going back to 2002 and 2003, when he was a Bush White House lawyer, one who extracted information from documents belonging to the staff of Democratic Sen. Patrick Leahy, a committee member — despite denials by Kavanaugh that he ever received it. The Mother Jones story also explores Kavanaugh’s apparent misstatements concerning his knowledge of the Bush 44 warrantless wiretapping program and torture policy (in 2006). The bottom line: Kavanaugh may be able to refute Blasey’s assertions about a long-ago incident at a party in Maryland, but that incident, whether it happened or not, pales (chronologically speaking) in comparison with the contemporaneous allegations that Kavanaugh lied as recently as weeks ago — in his testimony before the judiciary committee. Lying about something that happened 30-odd years ago, tree-ring time, is one thing. It’d be another mountainous challenge to Kavanaugh’s nomination if he were also found to have perjured himself this year, or this month, about other matters pertinent to his character and honesty and qualifications. 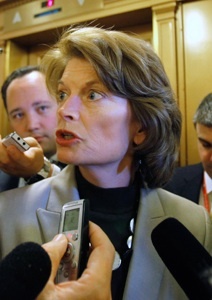 Hopefully, Collins, Sen. Lisa Murkowski of Alaska, Sen. Bob Corker of Tennessee, Sen. Jeff Flake of Nevada, and any other Republican senators seeking the truth in the Kavanaugh matter — or cover from their possible intent to vote against him — already recognize that Kavanaugh’s nomination needn’t hinge on any one thing. It could and probably should rest on a combination of matters, including previous deceptions that would seem to be just as disqualifying as anything related to Blasey’s allegations. THE COMMITTEE hearing scheduled for Sept. 20 has been pushed back; Republicans have offered to hear from Blasey on Wednesday, Sept. 26. Blasey's attorney, Debra Katz, told the Judiciary Committee on Sept. 20 that Blasey would appear for a Capitol Hill hearing if senators provide “terms that are fair and which ensure her safety.” The Trump administration now confronts a challenge unlike anything it’s previously encountered. Facing the certainly damaged and possibly doomed nomination of a singularly compromised candidate for the country’s highest court, House Trump is pushing against a growing chorus of opposition to Kavanaugh’s nomination. New polling finds public support for Kavanaugh hasn't just stalled but gone in reverse. Choosing to die on Kavanaugh Hill risks alienating millions of the same suburban white women, seniors, independents and women over 50 who helped power Trump to the White House in 2016, and whose votes will also figure in how well, or poorly, Republicans do in the midterms seven weeks away. That’s option one. Or (option two) Trump can come to grips with the declining return on investment he’s realizing with this flawed choice for the Supreme Court — he can admit a momentary defeat — and pick someone else. For the president*, one choice is unpalatable, the other is anathema. For an electorate that’s getting more restive, and a base that’s maybe more and more complacent in the face of Trump’s antics, neither option is exactly a confidence builder. One’s still better than the other, albeit not by much. 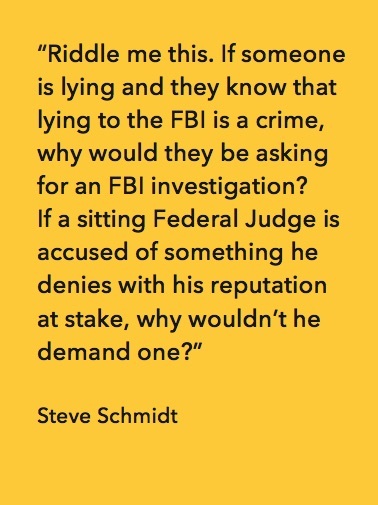 But Senate Republicans don’t have the luxury of looking at Kavanaugh’s obstacles in isolation; the nominee’s been shown to have lied or otherwise smudged the truth earlier in his judicial career, and he’s in the hot seat now for possibly having lied about his high school past. And practically speaking, it makes no sense for Blasey to volunteer to turn her life and her family’s life upside down for the sake of pursuing a decades-old lie. Guaranteed: Suburban women voters have been asking themselves those questions too. 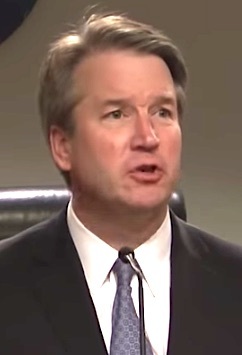 IN A MARCH 2015 speech, speaking at Catholic University's Columbus School of Law, Kavanaugh made a curious comment whose implied borderline anti-social context obliquely reinforced the idea that, hey, boys will be boys, some boundaries just don’t exist for some people. Some rules don't apply. “By coincidence three classmates of mine at Georgetown Prep were graduates of this law school in 1990 and are really, really good friends of mine,” said the judge. There may be no one in the country who wishes that were true more than Brett Kavanaugh. Image credits: Kavanaugh: Columbus School of Law. 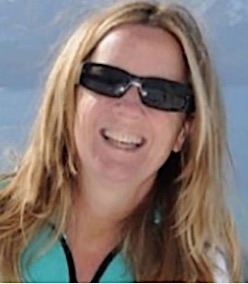 Blasey: The Ford family. SUMMER 2018, like most other summers the season of ball games and barbecues, has been more for students of the Trump White House. For them it’s been the season of the objective correlative -- the literary technique of representing a feeling with literal symbols that objectify that feeling. In recent weeks, for example, the east coast, and certainly Washington, D.C., have been hit with strong rains of varying intensity: weekends of water that sometimes fell at rates between one and two inches an hour. More recently — and consistent with a major hurricane lashing locales up and down the eastern seaboard — the physical reality of the weather is mirroring the parallel reality of presidential politics. Other storms have House Trump coping with torrential downpours of its very own. The dovetailing of objective reality and the presidential anti-reality of Donald Trump couldn’t be more apparent. 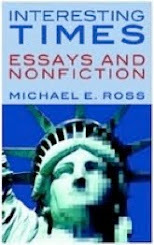 Neither could the almost-providential coincidence of the book Fear by Hurricane Bob Woodward, a work that lays bare the calamities, arrogances, stupidities and unforced errors by Trump & Co.; fresh attention paid to the might of Hurricane Maria (which devastated Puerto Rico almost exactly a year ago, claiming almost 3,000 lives, a death toll Trump now insists is a political fabrication); and Hurricane Florence, a monstrous and possibly historic storm that’s slamming into the Carolinas this weekend. But the presidential reality distortion field has buckled over the last two weeks. The presumed Great & Powerful Donald Oz is facing down an abundance of forces, from Capitol Hill to the streets, ready to reveal a presidency whose current implosion shouldn’t be a surprise, one that in so many dynamic, operational ways was on its last legs the day it began those 600+ days ago. 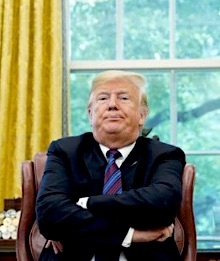 A CNN poll — the first such survey since the twin broadsides of the New York Times op-ed and the first excerpts of Woodward’s Fear — found that 32 percent of Americans see President* Trump as honest and trustworthy, a new low in his 20-month presidency. His approval numbers fell 6 percent in a month, mostly among independent voters. Interesting, though: In the same poll, 69 percent of the country thinks the economy is in good shape. Republicans may try to spin that number as favoring the GOP agenda in November, but there’s a problem with that: It’s the very fact that the 69 percent who view the economy favorably are at odds with the falling poll numbers for the president who’d take credit for that economy. The polling number for the people who celebrate the current economic momentum should be more in line with the polling number for those celebrating the president who (presumably) made that economy possible. The fact that they’re polar opposites is a problem for the White House. It means that the population, if not the electorate, has already made what for Republicans will be a seriously inconvenient leap: the ability to separate Donald Trump from the upbeat economy Donald Trump is erroneously certain he created. THE POLLS get worse. September 12 saw a trifecta of surveys on the midterms in general and The Don in particular. Three new polls on voting for generic House candidates indicated a growing rise in Democrats’ prospects. The new NPR-Marist poll reported a 12-point advantage for a hypothetical Democratic aspirant for the House, over a hypothetical Republican. Polls from Politico/Morning Consult and Quinnipiac University reported much the same information: slightly different margins (Dems have a 10-point bulge in the Politico poll, they’re 14 points up in the Quinnipiac) but the trend of Dems over GOP remains intact. A poll from CNN gives Special Counsel and Trump bête noire Robert Mueller III a 20-point edge over Trump in how well the Russia inquiry is being handled (a poll powered by a misnomer since Trump isn’t handling the inquiry at all, and goes so far as to deny it has any reason for being). On Sept. 10, a Quinnipiac poll on Trump’s overall job performance had Trump upside down, with 38 percent favorables, 54 percent unfavorable. The same day, a similar poll from CNN put the Don’s overall favorables at 36 percent, unfavorable at 58 percent. It’s all polling about Trump, of course, but in other ways, it’s about us. Our sense of relating to not just the president but also to the idea of America, which the president presumably embodies. These polls and others point to an American public starting to make and develop that distinction between the president and the presidency. One wave of predictable despond follows another. Even as Hurricane Florence batters the Carolinas — 5 people are dead at this writing — the president*, locked in the boundaries of his own private cape of fear, has gone a-twittering as usual, focusing as much on the rear-view mirror as what’s looming in the windshield in front of him, early and often re-litigating his administration’s utter failure of a federal response to Hurricane Maria, in Puerto Rico, a year ago. You’ve seen the videos — or you will — of an American flag methodically vaporized, at the mercy of the relentless wind of the Outer Banks, on top of Frying Pan Tower about 35 miles off the coast of Cape Fear, N.C. In just hours on Sept. 13, it seems, it became just what we needed: the single, unspinnable image of what we are now as a country — torn, fragile, fluttering in multiple directions — and an image whose power is enhanced by the fact that it occurred naturally, organically, a result of the velocity of the national weather. Not for nothing did Woodward name his new book Fear. The title of course perfectly captures the mood within the White House; and it defines the president’s* fundamental operational dynamic. It gets to the heart of all these poll responses. It distills the essence of what we so many of the people seem to be enduring right now, stoically or angrily. 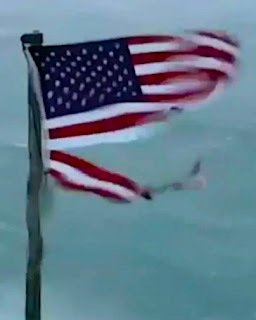 Like that flag: At the mercy of the winds around us, winds that seem to get stronger and more deliberately unpredictable all the time. 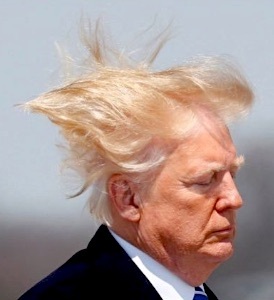 Image credits: Trump hair: via @TrueFactsStated. Fear book cover: © 2018 Simon & Schuster. FANS OF anthology television know the acronym “AHS” is shorthand for American Horror Story, the riveting and popular anthology TV series created by Ryan Murphy and Brad Falchuk in 2011. Every season since, fans have been treated to a new AHS set in a new locale with new characters and new and more horrific events. Last season’s AHS: Cult examined life in a small Michigan town in the wake of the 2016 presidential election, exploring the dark side of small-town politics. Maybe it’s time to consider flipping the script on what Cult examined. If Murphy and Falchuk ever briefly thought to give the AHS franchise a reality TV twist, they might consider a season not just inspired by that election, but one actually set in the chaotic, deliberately turbulent White House of Donald Trump, the president* whose thoroughly unleashed id has transformed the presidency and the national attention ... and ushered in horrors that TV couldn’t imagine. A fresh parade of horribles seems to step off at 1600 Pennsylvania Avenue every day, and thanks in part to a forthcoming book by the reigning investigative reporter in America, we’re witness to the degree to which name calling, backbiting, general bad manners, and various weightier civic atrocities that rise to the level of what the author calls an “administrative coup d’etat” are, going away, the rule at House Trump, not the exception. 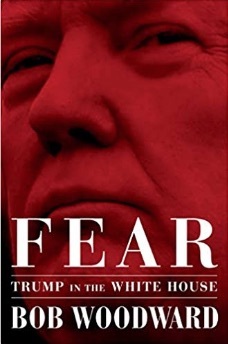 Fear (in bookstores Sept. 11) is the latest from Bob Woodward, the celebrated Washington Post investigative journalist in his own right, and one-half the dynamic duo that uncovered the Watergate scandal and hastened the political demise of Richard Nixon in 1974. Woodward turns his reporter’s eye on the Trump White House, its quirks and abundant dysfunctions. While only excerpts are available — some at The Post — those fragments deeply, sometimes comically, illustrate a White House in meltdown mode. Attorney General Jeff Sessions comes in for particular abuse by The Don. It’s widely known that Trump excoriated Sessions for refusing to recuse himself in the continuing investigation into Russia’s hacking of the 2016 election. Woodward reports that Trump called him a “traitor” for the act of doing his job. OTHERS DID what they could to blunt The Don’s “most dangerous impulses,” Woodward reports. 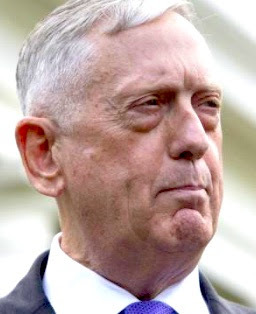 In a meeting in January 2018, Defense Secretary James Mattis was angrily nonplussed at Trump’s dismissal of the value of a U.S. military presence in the Korean Peninsula — basically, Trump’s attempt to reduce the need for that military presence to a mere financial cost-benefit analysis. Woodward writes that Trump questioned why the United States was expending financial resources in the region at all. “I think we could be so rich if we weren't stupid,” Trump later said in the meeting. Woodward reported that later, Trump said the United States was being played for “suckers.” Mattis testily countered, “We’re doing this in order to prevent World War III,” he said to Trump, according to Woodward’s account. But the problems go beyond petty backbiting and doing the innuendo. Sometimes, matters of geopolitical importance hang in the balance. 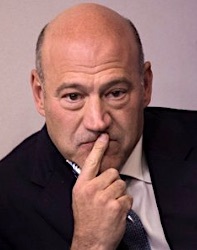 Woodward reports that Gary Cohn, former Goldman Sachs jefe and Trump’s former chief economic adviser, took official documents off Trump’s desk to keep him from signing them, including a notification letter to withdraw from the North American Free Trade Agreement. “This book is nothing more than fabricated stories, many by former disgruntled employees, told to make the President look bad. While it is not always pretty, and rare that the press actually covers it, President Trump has broken through the bureaucratic process to deliver unprecedented successes for the American people. Fire and Fury, by seasoned investigative reporter Michael Wolff, got outta the gate early. Published in January, Wolff’s book examines the early iterations of House Trump, in the first fits of power and pique, as Wolff moved around the White House with a long-term visitor's pass. His fly-on-the-wall approach angered Team Trump. In August, with her own fire and fury, Omarosa Manigault Newman, a longtime Trump Apprentice-era kindred spirit and former Trump administration official, published Unhinged, her own account of life during Trumptime in the White House. Also in August, Rick Wilson, a former Republican strategist, released Everything Trump Touches Dies, his viewpoint from the perspective of a GOP strategist and adman. And there were others before: Gaslighting America, The Plot to Destroy Democracy, Trumpocracy, and more. 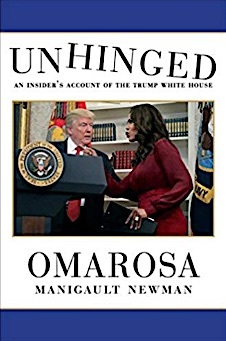 All of them illustrate a White House whose characterization as “Crazytown” couldn’t be more universally embraced; all of them, in their various ways, sign on to the ominous sentiment embodied in the title of another book on the Trump administration: It’s Even Worse Than You Think. If you look past the sheer towering foolishness of a comparison like that — the White House Counsel should expect a defamation lawsuit from the Hemingway estate — you read the words of a man enamored of himself, utterly reliant in his ability to write his way out of this crisis a few hundred characters at a time. He’s going up against writers and journalists and experts in the word — scribes that can sustain thought and argument for more than 140 characters at once. Or even 280. As the mayor of Crazytown, he’s free to enact any law or enforce any edicts he sees fit. But the authors of several books, and more besides, are taking him to task for (among other things) failing to recognize the boundaries of his absolute authority. Trump may run Crazytown with an iron grip and his word as law. The United States of America is another place, and another matter, entirely. Image credits: Fear cover: © 2018 Simon & Schuster. Mattis: via @thehill. 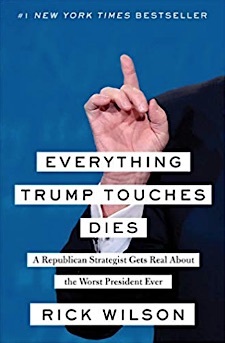 Everything Trump Touches Dies cover: © 2018 Free Press. Gary Cohn: via @BusinessInsider. Unhinged cover: © 2018 Gallery Books. FLORIDA FLORIDA FLORIDA: it’s the ultimate swing state, crazy from the heat of the weather or its own legislative invention, a lawless free-fire zone with guns more abundant than in the wild wild West. And with roughly nine weeks left before the November elections, the Sunshine State’s gubernatorial race is shaping up as the one to watch, thanks to an upset no one thought was possible, a racist dog-whistle everyone knew was probably inevitable, and the reliable potential for surprise common to a region in the center of the American Venn diagram of race and ethnicity, politics and the evolving national future. 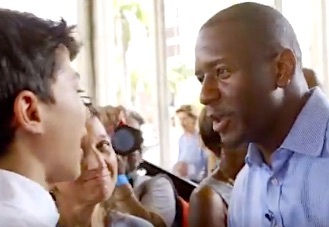 The Sunshine State has set the stage, and the stakes, for a compelling finale to the 2018 midterms, and quite possibly sets the terms of Democratic engagement with Republican power in 2020. There was idle talk that President* Trump had effectively nationalized the midterms, making them a referendum on his time in office. 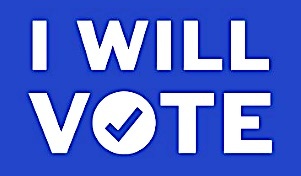 Inquiring minds would beg to differ: the midterms are necessarily a referendum on the people in state offices right now seeking re-election, and a gauge of the qualifications of those hoping to get elected for the first time. Trump can only hope the outcome of the midterms aren’t a national expression of his time in the Oval Office; the results of the latest Washington Post-ABC News poll would seem to say he shouldn’t do that.